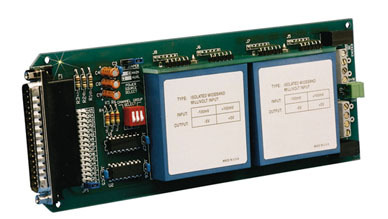 The OMB-DBK44 two-channel multi-purpose isolated signal conditioning card allows OMEGA’s OMB-LOGBOOK and OMB-DAQBOARD-2000 Series data acquisition systems to accommodate two optional OM5 isolated signal conditioning modules of any type*. Each user-configurable signal conditioning module offers 500 V isolation from the system and from other channels. It can accommodate an array of signals from low-level thermocouple signals to strain gage signals. The OMB-DBK44 features screw terminals that provide access to each channel’s analog inputs, as well as to the excitation output if the card is used with a strain gage or RTD module. In addition, each OMB-DBK44 channel has a cold-junction sensor mounted adjacent to each screw terminal block. This permits OM5 thermocouple modules to output linearized and compensated temperature. The OMB-DBK44 can be housed in a variety of ways, such as in the OMB-DBK10 three-slot expansion-card enclosure, the OMB-DBK41 ten-slot analog expansion module, or within the expansion slot of an OMB-DAQBOOK-112 or OMB-DAQBOOK-216. The OMB-LOGBOOK and OMB-DAQBOARD-2000 Series can provide power for the OMB-DBK44 via their P1 connectors. The OM5 modules used with the OMB-DBK44 typically require 5 V at 30 mA minimum, and can demand up to 175 mA in applications requiring excitation voltages. An external 5 V power supply may be required if the power requirements exceed the data acquisition system’s power output. The external 5 V source is connected to the OMB-DBK44 via on-board screw terminal connections. Please note that for applications that demand more than four isolated channels, it is more economical to use the OMB-DBK42 sixteen-channel isolated module. 참고: *OM5 modules must be purchased separately.